In my last post, I said I'd discuss the jangada in the next post. Here we are at the next post, but first, some news. My employment as an editor at McGraw-Hill has ended due to a layoff. I had been acquiring and editing books on boating for the International Marine imprint, and on other outdoor sports like hiking, camping, paddlesports, RVing, skiing, etc., for Ragged Mountain Press. These imprints are being scaled back for strategic reasons, and so our Rockport, Maine, office was closed. Both imprints will apparently continue, but publishing far fewer books each year, so the two managers were retained, and all the line-workers let go. Hence, I am now the proud proprietor of YOUR NAME HERE Communications, offering writing, editing, publishing consulting, and public relations services to private individuals (read: authors), small businesses, and publishers. I'll have a website up and running in a week or two, but if anyone wants information now, please feel free to contact me through this blog. Your query won't appear in the blog. On to the good stuff. 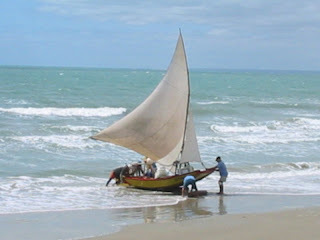 The jangada had its precolumbian origins as a raft plying nearshore waters on Brazil's northeast coast. (All this is per The Last Sailors: The Final Days of Working Sail , discussed in the previous post.) Soon after European contact, the demand for fish increased, and a sailing rig was added, but in its basic "log" form (more on this distinction soon), it's been unchanged for 400 years. 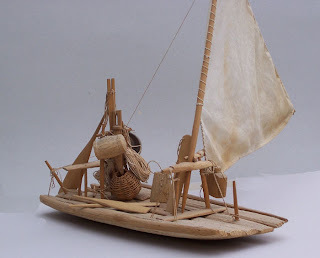 It is a sailing raft built of pueba logs, lashed and pegged together, and sporting a rig with quite a large mailsail and (from what I can tell from the book's photos), sometimes a tiny jib. The mast angles forward very sharply, and the boom angles upward at the stern, so that the mainsail takes the shape of an isosceles triangle resting on its apex. There's a surprisingly sophisticated 11-position mast step that allows the mast's angle to be changed by a considerable amount, no doubt shifting the amount of weather/lee helm, but otherwise, the jangada is about as simple as a craft can be. The jangadieros, or jangada fishermen, take these boats 30 miles offshore in search of market fish, with the logs awash the whole way. Steering is by way of an oar. Crews are often two or three, and according to author Neil Hollander, it's a firm tradition that no one speaks during the whole 12 to 16 hours that the boat is fishing. How wonderful! No office-cooler crap about the Final Four, the presidential primaries, or American Idol! The book also discusses a plank-built variant, the jangada tabua ("jangada of planks," pictured in the previous post) that hardly seems like a variant, and is evidently a different craft altogether with a similar name and milieu. From the photo and the book's description, it is clearly more of an open boat than a raft. It came into being when appropriate logs for rafts became scarce and sawn lumber became available as a feasible alternative. Probably, the name jangada was retained because the new boat was used by the same population, who knew fishing boats only by the name of jangada -- to them, the word didn't refer to a particular type, but was the equivalent of "fishing boat." When Hollander wrote about the jangada more than 20 years ago, they were extremely scarce, having been elbowed out by more efficient fishing craft. It would be interesting to know if any of the jangadiero villages still exist, and if they still use the log-built type. The photo of a model log-type jangada above is from Wikipedia by Wenn du Benutzer WHell. Sorry, Herr WHell, I've copied your credit, but I don't know German and can't provide your name properly, but many thanks for granting use through Wikipedia. The product links below? Well, there aren't many jangada-related books or other products available, so we'll have to make do with "rafts." Who knew that Jules Verne wrote a raft book? What raft could be more storied, goried, and romantic than the Medusa's? And the children's book The Raft looks lovely, doesn't it? This is the first post from my new computer. I had to give up my nice Dell Latitude yesterday because my employment with McGraw-Hill runs out at the end of the month, so I bought a new Dell Vostro as the basis of my new freelance editing, writing, publishing consulting & public relations business. So far, I like it. It's not as sleek as the Latitude -- physically a bit clunky -- but a real bargain price for a powerful machine, backed by Dell. I'm still getting used to Vista (had been using XP until now), but it doesn't seem that a big adjustment is needed. On to the real important stuff: I've been reading The Last Sailors: The Final Days of Working Sail , by Neil Hollander, with photos by Harald Mertes. Very nicely written and photographed essays on the men who made their living in sail on boats all around the world. The authors sought out and spent time with sailors of eight types of craft, most of which were clearly outside the Western tradition (I've italicised those that are): Windward Islands schooner; Brazillian jangada; Chilean lancha chilota, Egyptian aiyassa, Sri Lankan oruwa, Bangladeshi shampan, Chinese junk, and Indonesian pinisi. When it was published in 1984, and the authors warned that most of these craft were on the verge of commercial extinction. I suspect they were too pessimistic. Here we are 24 years later, and I'm under the impression that Chinese junks and Egyptian aiyassas still work for a living; it would be nice to know about them and the others. It would be nice if some readers would let us know what they know about this, and about other working sail around the world. Next post, I'll discuss the jangada, the very nice photo of which I've borrowed from Wikipedia, courtesy of the photographer, Allan Patrick. Subject matter and methodology aren't the only similarities between David Gidmark's Birchbark Canoe and John McPhee's much better-known The Survival of the Bark Canoe. Both are indeed about the same kind of craft; both are extended profiles of an individual builder of same; and both were written quite a few years ago -- Gidmark's in 1989, McPhee's in 1982. The most striking similarity, however, is how unpleasant said builder was. McPhee's book focuses on Indian canoe builder Henri Vaillancourt, who comes across as a dedicated egomaniac, a pretty good craftsman who feels that everything he touches is fine art. Gidmark's William Maranda, a Quebecois Algonquin, in contrast, is an unforgiving racist who blames the white race for just about anything that crosses his mind while, at the same time, enjoying American soap operas and 4WD pickup trucks. Gidmark became interested in bark canoes as a youth when he first observed a building demonstration -- apparently a not very skillful or authentic one, but one that impressed him nonetheless. His interest became so intense and so sincere that he moved to the Quebec town of Manawaki to learn canoe building from Maranda, one of the few remaining Algonquin builders. Maranda promptly turned down Gidmark's request based, it seems, on his disdain for the white race, but Gidmark had become so enamored of Algonquin culture that he settled into the town and began studying the language, the process of moose-hide curing, and other traditional skills and traditions. After observing him for more than a year, Maranda consented to teach him the craft, but he remained distant, never offering praise or encouragement. Eventually, Gidmark learned to build a bark canoe under Maranda's teaching, using pretty authentic methods. He then hooked up with a couple other native builders, Jocko Carle and Patrick Maranda, the latter a relative of William's. Jocko and Patrick proved to be much more pleasant, sympathetic teachers, and Gidmark's experience in Manawaki was ultimately a positive one, largely because of them. I read the original 1989 General Store edition of Gidmark's book which was an interesting read, but was not professionally edited or produced and suffered in its readability on those accounts, being somewhat halting in its diction and disjointed in the flow of the narrative. The book was republished in 1997 by Firefly, shown below (it appears to be still in print), but I haven't seen this and don't know if further editing was done to improve its readability. Gidmark has published several other related books, including a how-to book on building bark canoes based on the experience that he relates in Birchbark Canoe. Many thanks to Panera in Augusta, Maine, where most of these posts have been written. Good salads, bread, and wireless access!